Steve & Maria were great hosts. Beautiful, nice quiet place. Hope to stay there again. This was the first time we rented a private house instead of staying at a resort, and I have to say I was impressed by the natural surrounding of this this lovely house, lots of trees and within walking distance to the beach. The setting of the house is cozy and convenient, and the host Maria is extremely warm and welcoming, and we really enjoyed our stay. The breakfast area on the balcony is private, with a nice view of the rain forest. Everything is well covered, private, and yet close to nature. If you're a nature person, you're going to love this. For those of you who can't live without internet, you will appreciate the WiFi and the cable. My family actually used the dining area as a desk, and set up the laptop to watch our entertainment programming, quite a unique combination. Overall, we recommend this place, especially for those who want to try something different from the typical resort ambience and experience. We were surprised by a couple of things you need to be aware of before you book. First, the "kitchen" is on an open porch and comprised of an apartment sized fridge, a microwave, a toaster oven and a sink. We didn't cook a lot, so that was not a problem for us.There is no TV(although there is a DVD player). There is no air conditioner, but with ceiling fans, we were not uncomfortable at night.The WIFI is excellent. 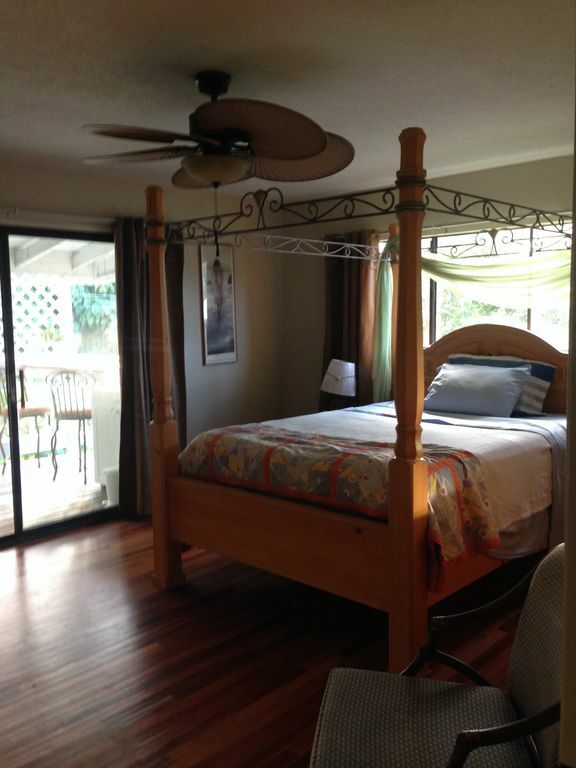 Beautiful hardwood floors; very clean throughout. Maria is extremely nice and willing to help you out if you just ask. Even with the things that were lacking, we enjoyed our stay there (we were gone during the days). We greatly enjoyed some days in this spacious accommodation located in a lush area. Fresh Avocado and Banana generously offered by Maria as well as the lovely sound of birds and frogs increased this feeling of staying in a paradisiac garden. We would certainly stay again at this wonderful place! Please practice Hawaiian Ohana custom of removing shoes before entering home. No cook stoves or open flames inside or on the lanai (porch). Grilling is permitted in backyard. Mahalo and we hope to help you enjoy your stay!